Life went on, and things were changing on the domestic front. There was a guy named General Eisenhower running for president who promised to bring our boys home from Korea if he was elected. People had faith in him because he had commanded the troops who hit the beaches in Normandy in World War II. That operation marked the beginning of the end of that other war, and the voters believed he could, by gosh, do it again! And he did. To a kid, the winding down of the Korean War meant there were visible changes taking place, changes a young kid could see. A man with the regal last name of Van Brunt was responsible for one of those changes in my own life. 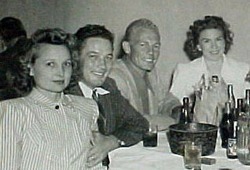 Blonde and Hollywood-handsome, he and his wife Helen and their kids were some of my family's best friends. Willard Van Brunt was my hero, because he had flown airplanes in World War II, and after the war he was a reservist in the Air Force. When Korea peaked in its utilization of modern day jets, he was activated to be a United States Air Force jet pilot flight instructor stationed at San Angelo, Texas. That was heady stuff to a ten-year-old. My dad answered. He talked for a few minutes, and when he hung up he excitedly announced that Van Brunt, as we called him, was going to buzz Notrees at noon the next day. I didn't know exactly what buzz meant, but I was excited anyway because my parents were excited. I finished my homework and went to bed and slept the sleep of the young, and in the morning I did what I always did: I rode exactly one mile to school on the school bus with my brothers and sisters and many school mates to the little country school where I worked and waited for recess and the lunch hour. Lunch hour was really important because it was our mother's belief that if at all possible, a child should have a hot lunch, and to that end she often picked us up in the family Oldsmobile and rushed us the mile back home for a lunch that she had prepared herself. Or, if Mom felt comfortable enough with the family funds, like she did that day, we would stop at the famous Cap Rock Caf� in Notrees, and we would get to order anything we wanted. I always ordered a hamburger. I was wired up tight waiting for the buzz. By now I was fully aware that it was going to be in an airplane, but I had no idea what it was going to be like, or if it was really going to happen. It was the height of the busy lunch hour at the Cap Rock Caf� that day in Notrees, Texas, and I was around ten years old. I remember exactly where I was sitting and exactly what I was eating when the activity in the caf� full of oilfield workers stopped dead still when we heard a sound like a gigantic explosion. Their first thought was of a gasoline refinery one half mile away, and their faces reflected dread and horror. But it was not my first thought, because in the midst of the shock and suddenly stilled voices as the jet roared back up into the sky, I dismounted my barstool in a rush and yelled out to everybody, "It's Van Brunt, it's Van Brunt!" and I raced to the front door of the caf�. With eyes glued to the sight, we saw the airplane hook around at the top of the climb and start a steep dive back toward the caf�. Wide-eyed and mesmerized now, we saw the jet to our right, less than a mile away. It leveled out right over the highway in front of us, and in an eerie scene that our brains could hardly comprehend the jet seemed silent in its rush toward us. As it approached at a dizzying speed, a strange buzzing sound preceded it, a sound made by trillions of molecules being rapidly pushed out ahead of the jet's path, and then, just as quickly, there was another brief silence before the jet's whooshing roar hit us with the delayed sound of jet exhaust. When the airplane blasted by us, it was so low to the ground that all of us awed spectators could see the two helmeted pilots and the oxygen masks covering most of their faces. Both men were looking down at us, seemingly right in the eyeball; I felt they could see me. The sleek jet couldn't have been more than a hundred feet above the ground when it pulled up into another steep climb, and again, after more aileron rolls, it topped out high in the sky, leaving us engulfed in that delayed roar of jet exhaust and the smell of spent jet fuel. It was surely louder than the proverbial opening of the gates of hell. Willard Van Brunt commenced another diving turn, and he came down right at us, right down the "main street," barely telephone-pole high, giving us one last breathtaking thrill as they streaked by us. That last pass filled just a second, a long second, frozen in time, down low at our level again, and we all knew the show was over by the way he climbed, without rolling. I could not take my eyes off the airplane as it shrank to a speck in the sky, heading east, back to its base. Finally, and without my brain's permission, my eyes blinked, and the jet disappeared into the distance. It was all over in less than two minutes, but in reality it has lasted a lifetime. What a show! Slightly dazed, we all slowly went back into the Cap Rock Caf� to talk about and contemplate what we had experienced. We knew we would never forget what we had just seen. It was a different little guy who climbed back up onto my barstool. Totally impressed, I wondered if I would ever in my life have a chance to do what I had just seen. I finished my hamburger--the hot lunch my mom wanted me to have--and then went back to school. My World War II mentality dimmed, and the dawn of my jet age had begun. In 1967, fifteen years or so later at age 24, at Reese Air Force Base in Lubbock, Texas, and as a civilian flight instructor training air force students, I was given the privilege of taking two jet trainer flights in one day. You can bet that as I streaked upward and did aileron rolls in that twin engine jet airplane over the panhandle of Texas, I was thinking euphorically about the famous Cap Rock Caf� and the folks watching Willard Van Brunt as he blazed down main street and then back up high into the memorably blue west Texas skies.